A walk on Jalan Tan Hiok Nee will take you pass charming coffee shops, old provision stores, a traditional charcoal bakery and to OCBC Bank – the bank for Johor’s pioneer overseas Chinese. 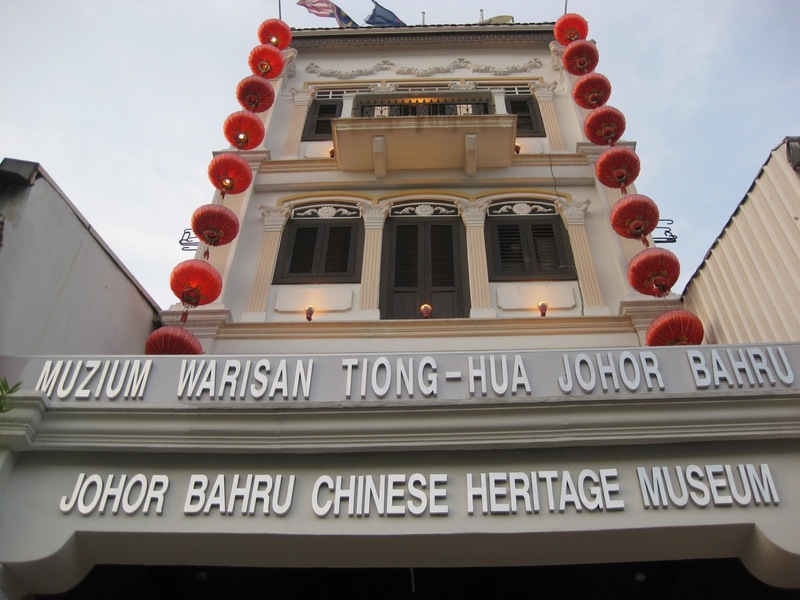 It will also lead to the rear entrance of the Johor Baru Chinese Heritage Museum, a 4-level building that can be accessed from two entrances, Jalan Ibrahim and Jalan Tan Hiok Nee. 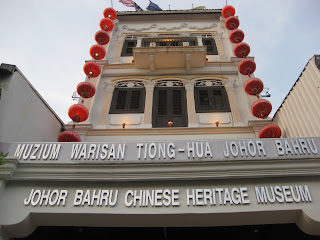 This building, occupied by the Johor Bahru Tiong-Hua Association since 1948, was officially opened as a heritage museum in October 2009. 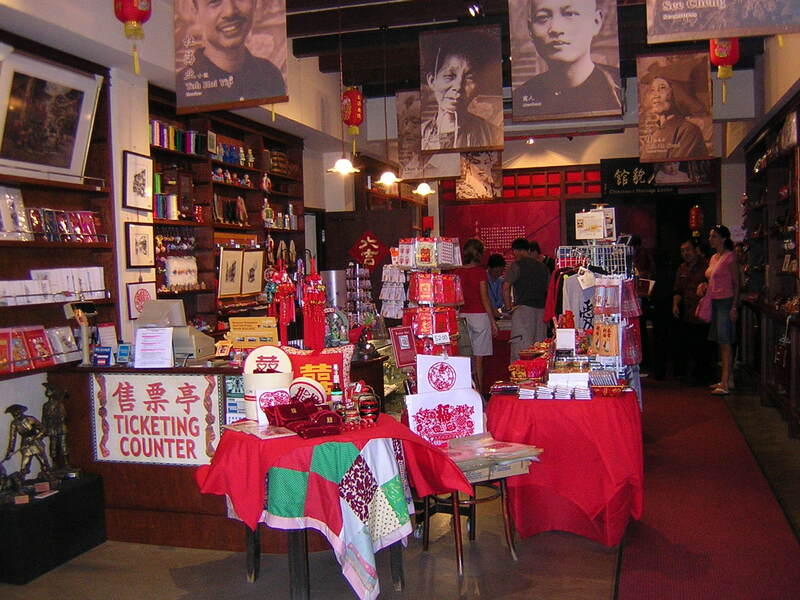 A visit to the museum is an enriching experience not only for those who wish to learn more about the culture and heritage of their forefathers and early Chinese immigrants in Johor but also for everyone who is keen on history. Valuable artifacts, contributed by families, collectors, schools and associations, are carefully preserved here as a reliable source of information for the benefit of future generations. A great deal of thought and research has gone into organizing the layout for visitors to follow the sequence of events and better appreciate the history of the Chinese in Johor. On the ground floor, read a brief chronology of history on a giant poster that spans the entire lobby wall. This brief overview outlines the sequence of historical events, carefully laid out in the museum. To save energy, lighting at every level is controlled by sensors that will respond when you step in and for your convenience, information throughout the museum is provided in three languages – Chinese, English and Malay. Your tour of the museum is ingeniously designed in such a way that when you arrive at the top of the staircase to the first floor, it is as if you are stepping off a boat, just like the early immigrants. 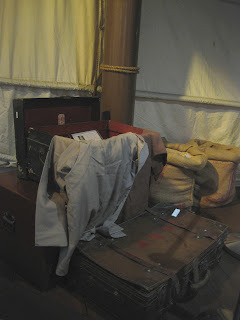 This scenario literally transports you to another era when immigrants stagger off the boat in a foreign land with a few humble possessions after braving a long and dangerous journey by sea in overcrowded and unhygienic conditions. For many, poverty, oppression and injustice may have driven them from China in search of a better life overseas. Useful information is presented in a range of wall plaques and through interesting documentaries screened on large flat-screen TVs. 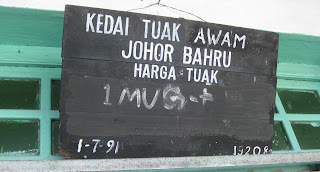 Names like Tan Hiok Nee, Wong Ah Fook as well as Ngee Heng and Kangkar Tebrau will take on a new meaning as you understand the history of Chinese associations in Johor. In addition to learning about the early economic development of Johor through the cultivation of pepper and gambir, you can also gain further insight into the history of Chinese-Malay relationships that under girds the strong support between the Johor sultanate and the Chinese community today. 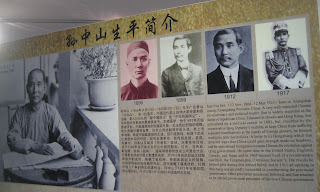 The display also explores the development of the five individual clan associations for the Teochew, Cantonese, Hokkien, Hakka and Hainan dialects and their unique unity in the Johor Ancient Chinese Temple at Jalan Trus. From a common place of worship to a common school and a common burial ground, the Chinese certainly have a distinctive history in Johor Baru. The city also boasts a unique annual tradition of a 3-day religious celebration that culminates with the colourful Chingay parade, an event recognized by the 2009 Johor Tourism Awards as the Best Domestic Event. 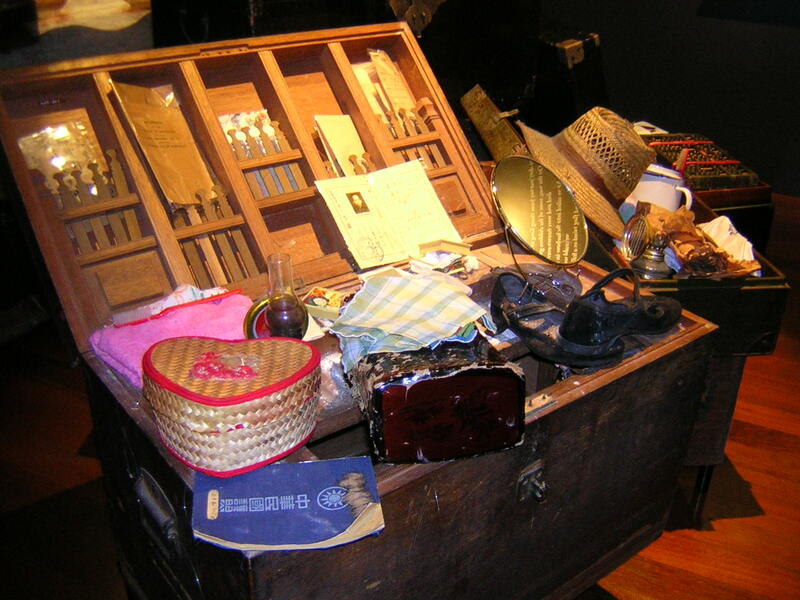 A number of interesting and invaluable artifacts are displayed in the section on the Turbulent Times during the Japanese Occupation and the nation’s struggle for independence. This is where you can see a Japanese samurai sword and military beret that clearly represents the grief of a suffering Chinese community in this difficult era. Then look closer at samples of ancient documents like a Provisional Passport, a wedding certificate as well as a War Damage Claim! The top floor of the museum currently features an exhibition on the life and achievements of Chinese revolutionary and political leader, Dr Sun Yat Sen. Visit this temporary exhibit to find the answer to this burning question: “Did Sun Yat Sen come to Johor Baru?” When this exhibition ends in March 2012, you can look forward to the next exhibit dedicated to the role of the Ngee Heng kongsi or association, in Johor’s history. Before you leave, remember to sign the guest book at the ground floor lobby. This is an opportunity for you to pen your thoughts or comments and put on record that you were here. There are also forms for you to give any constructive feedback so that the curator can take the necessary action to improve the museum facilities. 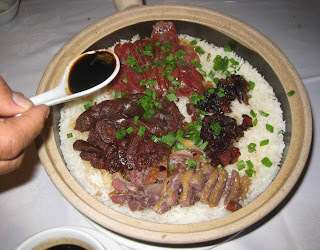 It’s that time of year again for feasting on traditional food and one of my favourite foods this season must be lap mei farn or rice steamed with waxed meats. My earliest memory of tasting this fragrant dish is in my grandmother’s kitchen at No. 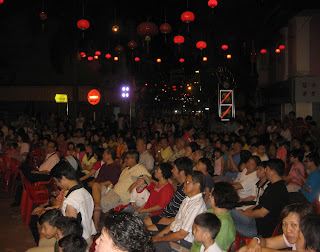 154 Jalan Ngee Heng during Chinese New Year. Her busy kitchen would be filled with a blend of delicious aromas from her signature braised duck, Chinese cabbage-chicken soup and especially the variety of waxed meat being steamed with rice! Even as the rice pot lid was slightly lifted open, the fragrance of freshly steamed waxed meats would waft out to further whet my appetite. 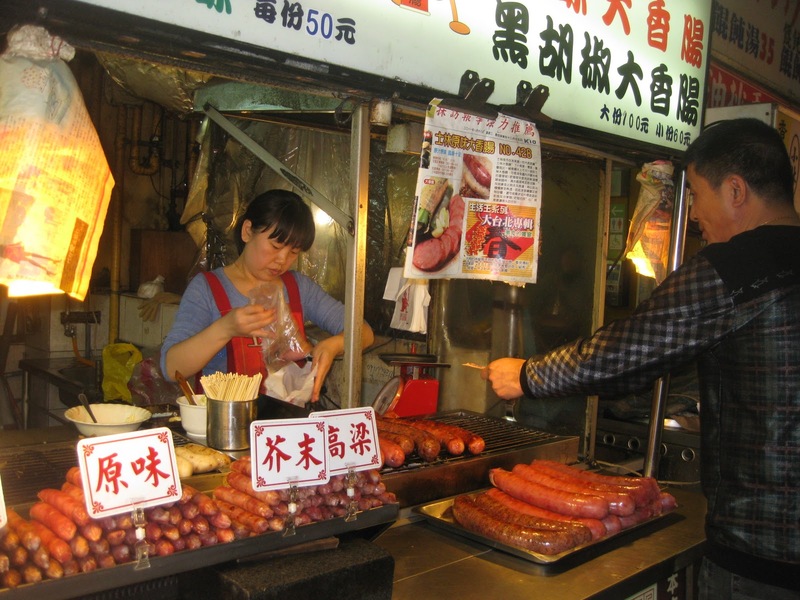 The oil and juices from these Chinese air-preserved meats – lap cheong [waxed sausages] and lap arp [waxed duck] – would soak into the rice, turning the whole pot of rice so full of flavour and fragrance. 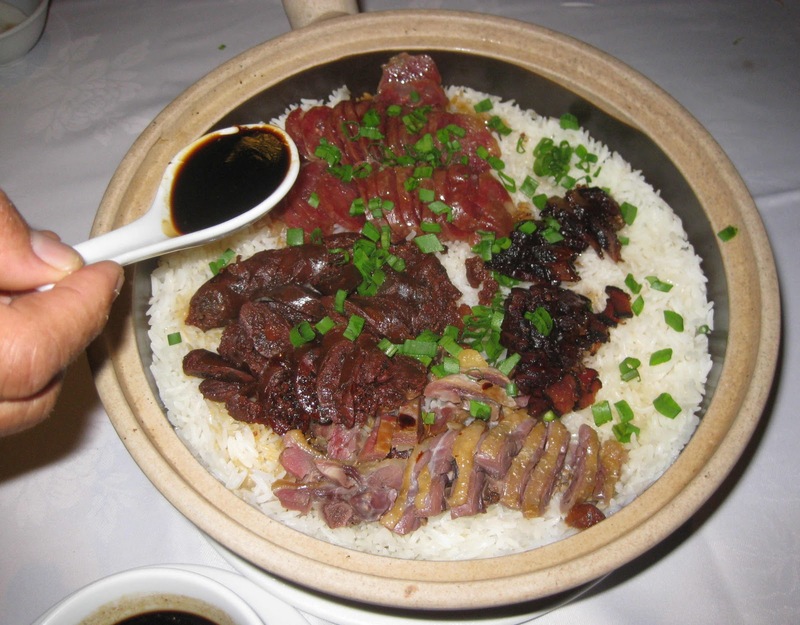 When the rice was cooked, grandma would remove the waxed meats from the rice and slice them into bite size to serve the meat separately with a drizzle of thick, dark soy sauce. To describe how delicious her lap mei farn is, grandma used to say that each mouthful would, tah kwon tau or somersault into our stomachs! Incidentally, this waxed meat delicacy from China does not contain any wax but the meats, marinated in salt and wine, are air-dried or smoked to be preserved without refrigeration. While I’m familiar with a range of waxed sausages and waxed duck that grandma used to serve at Chinese New Year, I discovered on a recent trip to China that the Chinese eat a wide range of preserved meats and pork products. These products may not be sold openly in our country but I saw quite the opposite in China and neighbouring Singapore. To me it was such an unusual sight and I couldn’t resist taking a few shots of these intriguing meat products. From their facial expressions, I guessed the locals must be amused at my interest in their pork and probably thought that I’m just a crazy tourist! I’m used to seeing Chinese sausages in standard six-inch sizes so it was surprising to see giant size [uncooked] sausages stacked up for sale in a Shanghai supermarket! I guess if you accidentally dropped one giant Chinese sausage on your foot, it could do some serious damage. Can’t imagine if this whole stack collapsed on someone! Unlike the Cantonese lap cheong, Taiwan sausages are usually stuffed with fatty pork and are not air-dried. 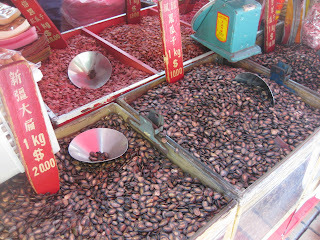 It also comes in giant-sizes and can be baked, pan-fried or grilled but they taste distinctly more sweet than savoury. 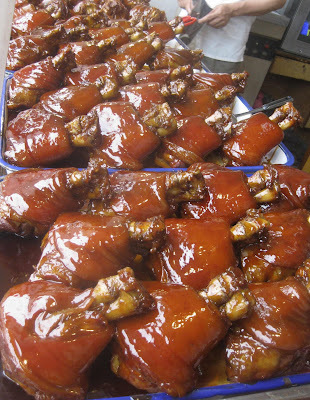 One of the sights that caught my attention on a visit to Zhouzhuang, an ancient water village near Shanghai, was these eye-catching trays of glazed pork knuckles. 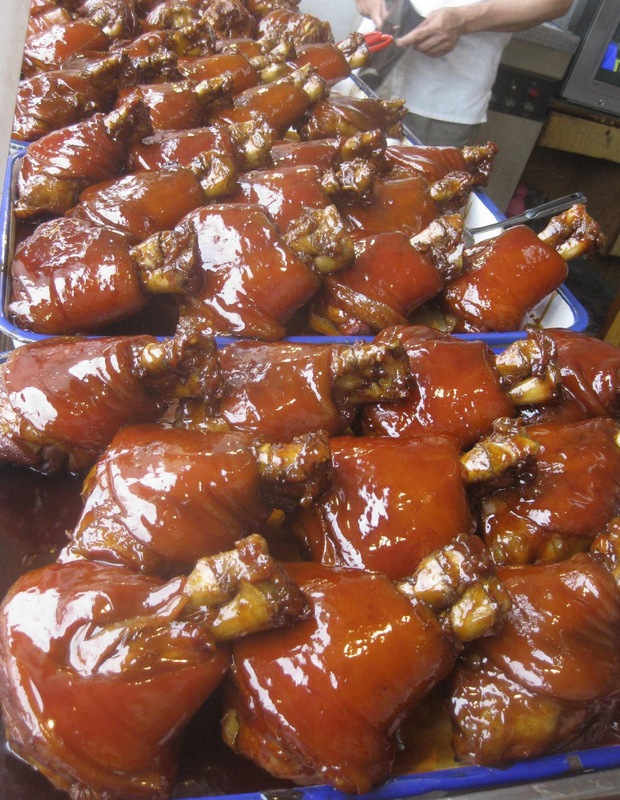 Popular Wansan pork knuckles and trotters or pig hooves, [I read the translation!] are sold as snacks. I must confess that it was difficult not to stare when I spotted a couple seated on a stone bridge, chewing on a pig’s trotter each! Ugh…how romantic!? I came across this butcher’s shop while strolling around the French Quarter in Shanghai and couldn’t help but stop to admire the variety of vacuum-packed slabs of pork belly and preserved whole legs [Right wall]. 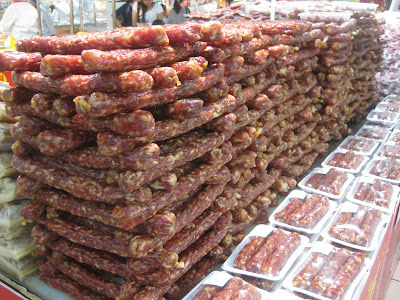 Don’t miss the string of hanging giant lap cheong! Pig snouts are a delicacy for those who enjoy pork scalp snacks! 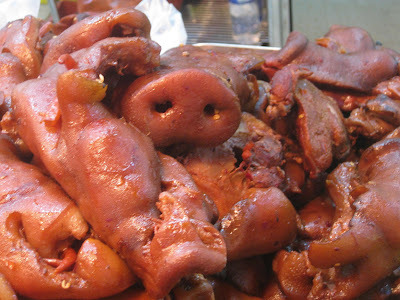 Already acquainted with pork knuckles and trotters or pig hooves as snacks, I thought nothing should surprise me but I did not anticipate seeing a large pig snout among the pile of pork in a food stall at Singapore’s Chinatown! I paused to watch, both fascinated and stunned, how customers would pick their choice and have it sliced up to enjoy as a crunchy pork scalp snack, chee thow pei! Whether in the festive season or on ordinary days, this is clear proof that the Chinese love pork. They truly know how to enjoy food and there’s even a saying that the Chinese will eat any living creature with four legs and have backs that face the sun. 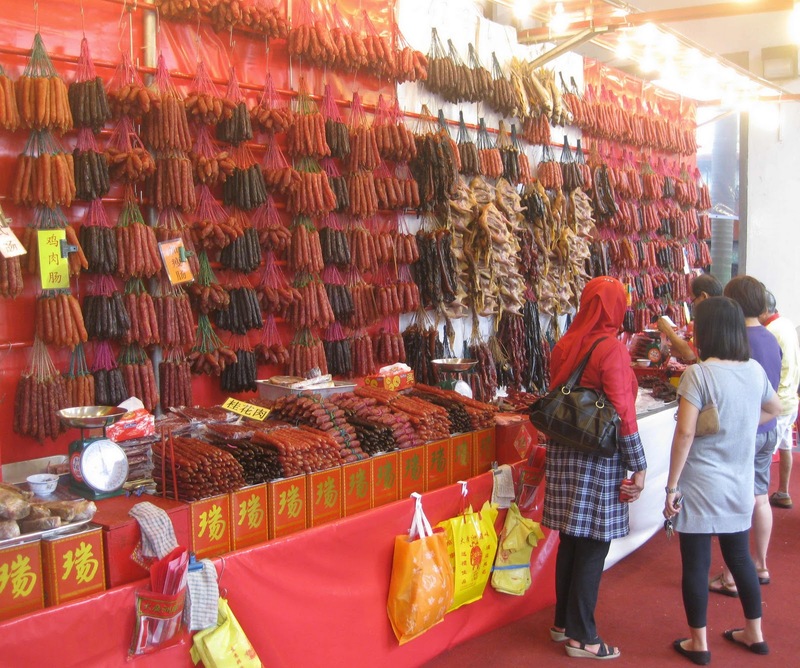 So while you are feasting on festive banquets this Chinese New Year, don’t be surprised if you discover that the Chinese eat more exotic and interesting ingredients other than mere pork! Happy Feasting! No prizes for the right guess! This is what mum served for lunch today... yum! 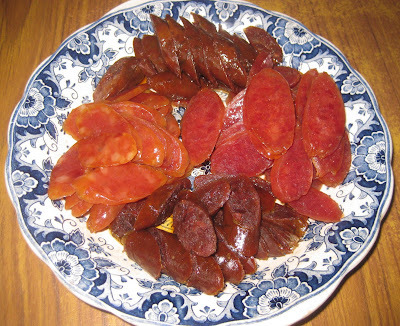 Yon cheong is the type of Chinese sausages [darker in colour] that are stuffed with duck liver marinated in wine. And yes, dark soy sauce is served on the side as a dip or to mix with the steamed fragrant rice. 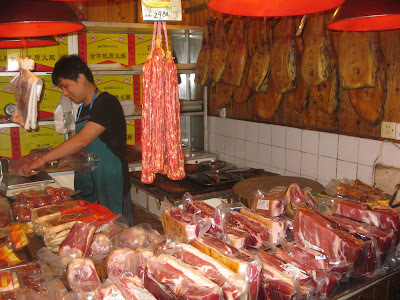 This post is dedicated to Chris, my blog sifu, who can go pork crazy when he's pork-deprived! Shopping for clothes, especially in the festive season, should not be stressful but the teeming crowds and long queues for fitting rooms and at pay points, just saps the joy out of shopping. I’m seeing red again this Chinese New Year because slacks, dresses, tops and jackets are created in every shade of red. These are too over-the-top for me so I will instead, dress up my outfit with bright accessories like shoes, bags, belts and costume jewellery. It can be exhausting to be a fashion-follower because fashion trends change ever so quickly. So I flip through fashion magazines or go window-shopping to get ideas and then update my style by finding a few affordable pieces to add to my wardrobe instead of buying everything new. Even if Chinese New Year traditions dictate dressing in something new, I can wear just one new item to make my whole ensemble new! 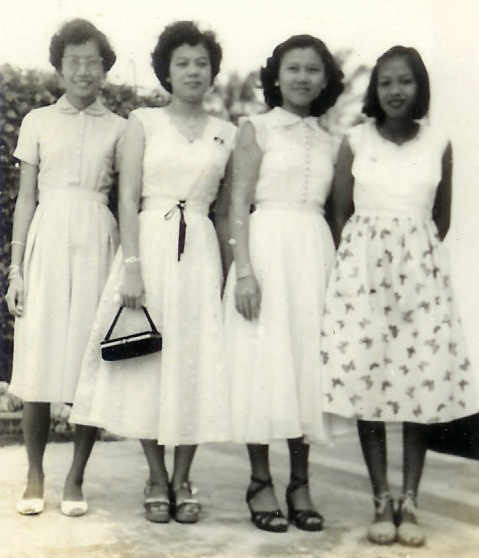 Recently I found a few old photos taken in the 50’s of my mum and aunts with their friends and saw some fashion ideas for a totally vintage look. It struck me that these fashions are perennial looks that are reinvented by designers in recurring cycles. As more celebrities have been seen wearing vintage dresses and longer skirts, I’m excited that these styles are making a comeback. 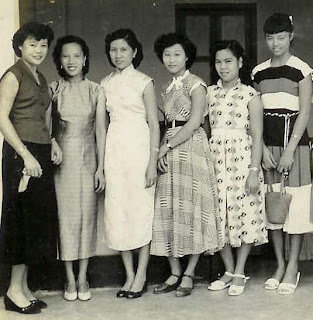 It’s interesting to see the various types of skirts – flirty flared, narrow pencil or round poodle skirts – that are still worn at various lengths today. In those days, their lengths were comfortably covering the knees or at calf-length. 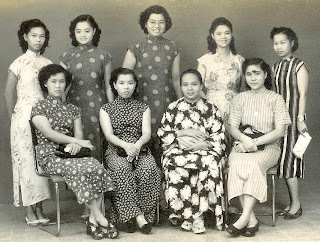 The cheong sam, modestly cut in straight shifts instead of figure-hugging shapes, have side slits that are also no higher than the knees. The fabrics they wore in the 50’s featured stripes, dots, plaid, flowers and butterflies – designs that remain very much in vogue today. My tailor says that the length of sleeves matter very much in the overall look and these ladies’ lovely outfits show off a range of long sleeves, half sleeves, cap sleeves or are sleeveless. It’s also remarkable that the necklines, whether round, v-necked or open collars, are all sewn decorously close to the neck. 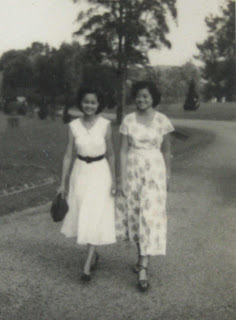 In a photo, mum and Aunty Wong, her former colleague, are wearing cheong sam sewn from the same fabric so I asked mum why. I even wondered if the cloth cost less if they bought it in bulk but she told me that they bought it together in Singapore and had the cheong sam tailored in Johor Baru. In those days, it was fashionable for friends to dress alike and take a studio group shot together to keep as a memento! While many celebrities wear ultra-high platform heels as a sensational fashion statement, you will agree that it’s definitely impractical for us to totter around on such impossibly high stilts. I like heels but I notice that most Asian men feel vulnerable if I tower over them so I lose my heels in favour of lower footwear. Basic black is highly wearable but I also enjoy wearing footwear in bright colours like red, blue or white. 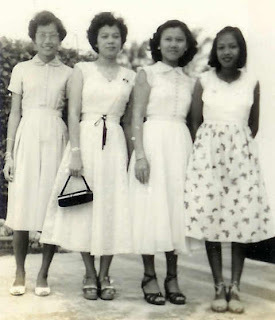 It’s fascinating that the footwear fashion of the 50’s seems to have come full circle because today we still have strappy platforms, peep-toe sandals and court shoes as well as casual espadrilles designed with fabric fastenings. Flatties and wedge shoes are very much in fashion and smart two-tone shoes are also making a comeback. Similarly, the elegant handbag and clutch purse designs from those days are still very trendy now. At the dawn of the Dragon year, everyone will be stepping out in something bright and new so I’ve got every reason to dress up too. I know I can’t go wrong if I wear an elegant cheong sam or a Chinese inspired outfit and dress it up with the right accessories. Or maybe I should just raid my mum’s wardrobe to find a vintage outfit to borrow! I’m all for dressing with decorum. I meet a wide spectrum of people at various events so I will dress according to the weather and the occasion, and always for the cultural setting. The rule of thumb is to attract attention for the right reasons and not let Moral Fashion Police, who are usually self-appointed, catch me for being guilty of offending any eyes and sensibilities! Happy Chinese New Year! I enjoyed reading your blog on fashions, Peggy. Even though the photos are small and black & white, I can see you in your mum! “Let’s go to Chinatown!” said my friend Bhanu, echoing my enthusiasm to experience the festive action in Singapore’s Chinatown. 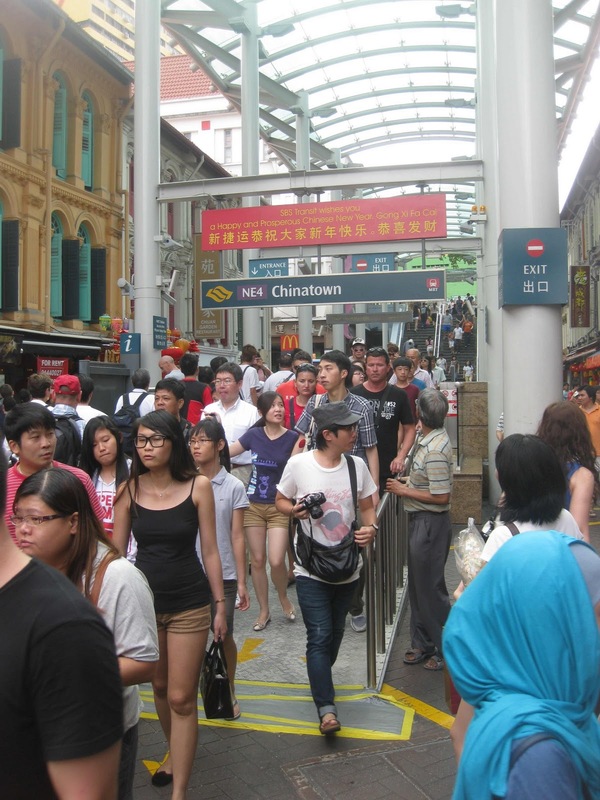 I know two more tourists will not make a difference to the crowd because we will join many who go there before Chinese New Year just for a feel of the festive excitement. It’s actually located overseas but the best part is we don’t have to fly there. So armed with our passports and some foreign currency, I check Google maps for the easiest route to drive from Johor Baru. In less than an hour, we are on Victoria Street that leads directly into New Bridge Road that runs parallel with Eu Tong Sen Street. The sight of bright red festive street deco bordered by malls like Chinatown Point and People’s Park Centre, assure us that we are on the right track. Passing under a giant dragon that spans an overhead bridge, I decide to park in the nearest building because the best way to explore Chinatown is on foot. Incidentally the term, “Chinatown” usually refers to enclaves in regions where the Chinese are a minority community but in Singapore the Chinese are the largest ethnic group. Tourists like us conveniently call this area Chinatown but Chinese Singaporeans traditionally refer to it as “Niu Che Sui” that literally means “cow-pulled water cart” or kereta ayer in Malay for the bullock-carts that used to haul drinking water. Kereta Ayer is in the heart of Singapore’s Chinatown. We walk straight into the bustling crowd and the first familiar sight I spot is a wall with an array of waxed specialties. As I pause to look at the dried sausages and ducks, I’m distracted by the interest a Muslim lady was showing in the merchandise. I guess her friend must be telling her that this delicacy from China does not contain any wax but the meats, marinated in salt and wine, are air-dried or smoked to be preserved without refrigeration. It’s also one of my Chinese New Year favourites steamed with rice and savoured with a drizzle of dark soy sauce. Yum! 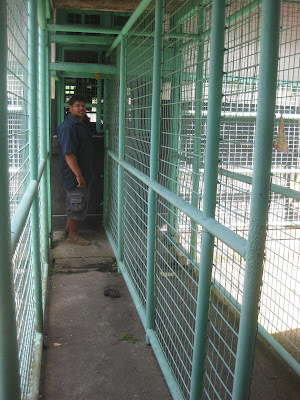 Bhanu and I take our time to walk along the paved five-foot-ways of pre-war shophouses, peeking in shop windows and taking in the sights and sounds. I think many merchants are probably still involved in the businesses handed down through generations. Now they may have updated shopfronts but are still dealing in gold and jade jewellery, branded fountain pens, traditional handicrafts, fabrics and fine silk, roots and herbs to seasonal high-value specialties like dried mushrooms and seafood. It’s interesting to see that every shop is filled with customers, busy picking out their choices for the festive season. Leaving the crowded shops, we enter Yue Hwa at the corner of Eu Tong Sen Street and Upper Cross Street for a truly Chinese experience. This is a large emporium – I like this word for its nostalgic feel – or Chinese themed department store housed in a stately six-level building. Built in 1936, it once was a leading hotel in Chinatown. 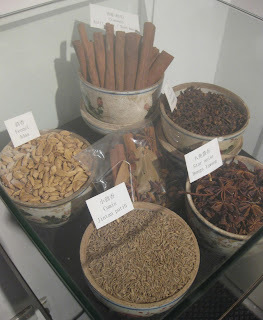 Besides a whole floor dedicated to Chinese traditional medicine, one to antiques and another to tea and tea-making accessories, I’m delighted to discover a wide range of lovely Chinese inspired blouses and cheong sam here. By this time, the crowds outside have swelled to peak weekend proportions but we bravely plunge into the jam-packed street market lined with stalls around Pagoda, Smith, Trengganu and Sago Streets. Every stall seems to have something interesting vying for my attention and the variety is simply mind-boggling but I steel myself from falling in love with anything. 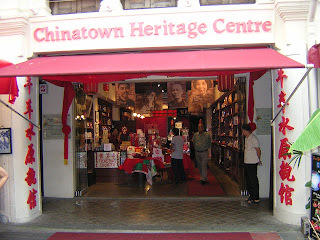 The Chinatown Heritage Centre on Pagoda Street is my favourite spot here as it houses a recreation of life in 1950’s Singapore. I declare it a “must-see site” for everyone keen on heritage as it portrays the lifestyle of early Chinese immigrants, carefully reconstructed in insightful tableaus, complete with interesting information and sound effects! No Chinese New Year is complete without bak kwa or barbecued meat and this is evident from the long line of people queuing from the Lim Chee Guan shopfront, snaking across the front of three more shops. 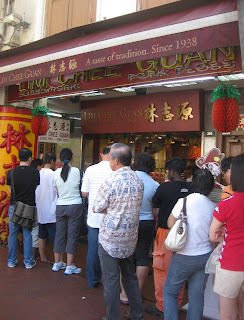 The sign says, “Since 1938” so I guess the juicy perfection of this signature bak kwa must have remained so good through the generations that these fans don’t mind queuing for up to four hours to buy this tasty treat. I have never tasted it but I will take the patient long queue as proof of such a special flavour that’s worth every moment of the wait. the adventurous eater in Chinatown, Singapore! Another rare sight to enjoy here is kuaci or melon seeds sold loose in open boxes. I don’t know when I last saw kauci being sold this way in Malaysia because black melon seeds are now sold in sealed packets all year round while red kuaci have virtually disappeared from our local markets. Watching customers sample the kauci before buying brought back childhood memories of how I used to hold the tiny melon seed between my little fingertips, trying to crack it open with my front teeth. But even after many attempts, I failed to split the seed because the kuaci kept slipping from my wet lips and fingertips. Singapore is predominantly Hokkien-speaking but from the memories shared by my grandma, I know that Cantonese is the main dialect in Chinatown. However, as we walk through the food street, the dialect I keep hearing appears to be Mandarin tinged with a heavy foreign accent. I then realize it’s because the vendors are from Mainland China. While many of the street food look interesting, they are also alien to me probably because it’s not typically Singaporean now. It’s also not for the faint-hearted because I was stunned to spot a large pig snout among the pile of pork that customers can pick and have it sliced to enjoy as a crunchy pork scalp snack! The Mass Rapid Transit (MRT) is the most convenient way to Chinatown through the Outram Park (EW16) or Chinatown (NE4) stations. When you take Exit A out of the Chinatown station, it will lead you directly into Pagoda Street which is part of the Chinatown street market and closed to vehicular traffic. For a more dazzling experience, try visiting Chinatown by night. The Singapore Chinatown Chinese New Year celebration in the theme, “A Bountiful Year of the Dragon” is a colourful and exciting programme from 1 to 21 February 2012. 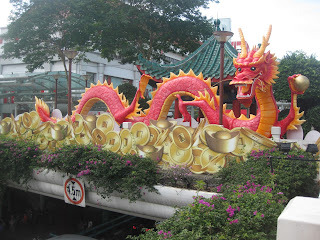 This is part of the Hua Qing Spring Festival celebrations that includes River Hongbao and Chingay. Not too long ago, Malaysia and Singapore were one country. Our communities share a common cultural heritage and many still have family members on both sides of the causeway. While some may have heard historical anecdotes from elders and grandparents, most of our younger generations haven’t the foggiest idea of what life was like for the early immigrants. 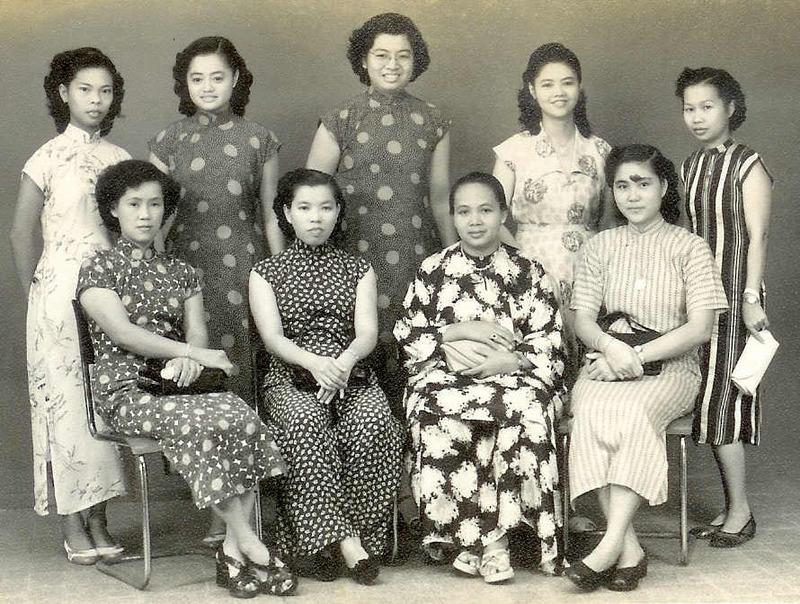 Now here’s an opportunity to go back in Time and be transported into an era of coolies, majie and samsui women. The Chinatown Heritage Centre presents an authentic setting within the very walls where Chinese immigrants used to live along Pagoda Street, in the heart of Singapore’s Chinatown. A visit to this museum should open our eyes to how early immigrants thrived in the harsh circumstances and help us to value the struggles of our forefathers. It’s an educational and informative trip, not only for the Chinese but for everyone who loves culture and heritage. Unlike any museum in Singapore, this is housed within three beautifully restored shophouses. Each of the three levels, accessed by steep, rickety wooden stairs, takes you to a different time in the history of Chinatown and allows you to trace the lives of the early settlers. If the walls of these shophouses could speak, what exciting tales they would tell! 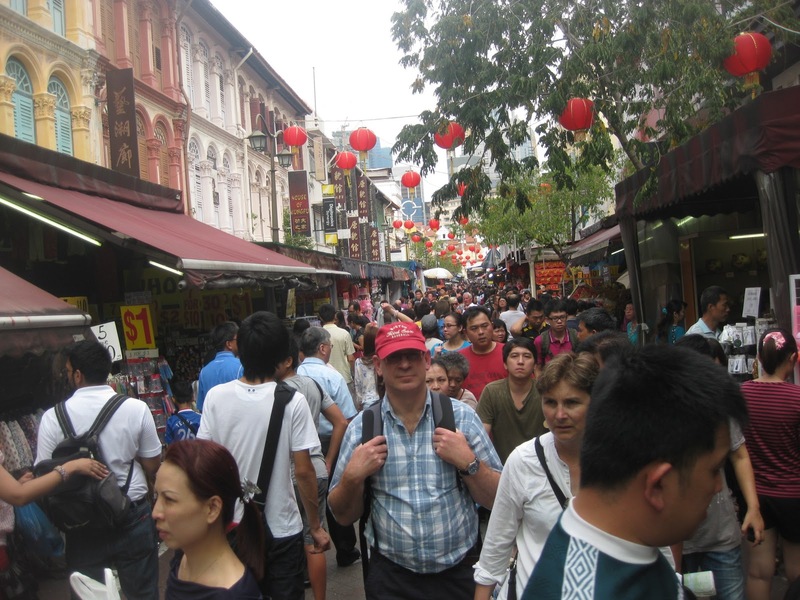 The rich cultural history of Singapore’s Chinatown will come alive as you experience life in the dark and cramped quarters of typical shophouses in the early 1950’s. A walk through the museum will show you exhibits that are created from the memories of actual tenants of these shophouses. Interactive displays, interviews and audio-video elements, and especially dialogues in Cantonese dialect, make this experience very realistic. An immigrant who has just arrived in the newly adopted country is called a ‘sinkheh’ meaning ‘new guest’. Poverty, oppression and injustice may have driven these immigrants from their homes in China in search of a better life. Braving a long and dangerous journey by sea in overcrowded and unhygienic conditions, the immigrants arrive in the foreign land with a few precious possessions. 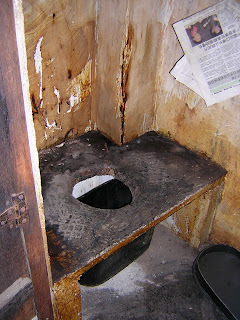 The sinkheh’s hard life in a strange land sent many to seek solace in the four evils: opium smoking, prostitution, gambling and being involved with secret societies – vices that caused the downfall of many young migrants. You can catch a glimpse of a prostitute's typical bedchamber behind a gauzy curtain and don’t miss the candid responses from a former prostitute recorded in an audio-visual interview. Enjoy the gallery that depicts the streets of Chinatown that are bustling with business, better known as “the place where the day never ends”. As you look at the street vendors, also check out rare video footage on the sale of exotic animals that were considered delicacies to the Chinese. Another gallery displays Chinese cultural celebrations like Lion and Dragon Dances for Lunar New Year, Chinese opera shows as well as a somber setting for a funeral. One of the attractions is the portrayal of life in a typical Chinatown shophouse. 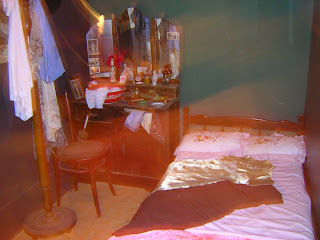 Rooms, no larger than a cubicle, are occupied by sinkheh of various trades and each room showcases how these thrifty people shared their living space with trading equipment, personal belongings, friends or family members. At each level, all occupants share a common kitchen, bathroom and toilet at the end of a long and narrow corridor. Tailors, who are more affluent than the other occupants, have exclusive use of the airwell to dry their clothes. The setting in the tailor shop is so real that the books lying open are in fact, original documents that recorded the measurements of their former customers! There are rooms for female sinkheh like majie, a sisterhood of maids who wear uniforms of black silk trousers and white cotton blouses. They live with employers but return to these shared rooms only twice a month to catch up with friends or read letters from home. Samsui women are another hardworking group employed at construction sites, usually to carry building materials in two large baskets balanced on the ends of a long pole across her shoulders. 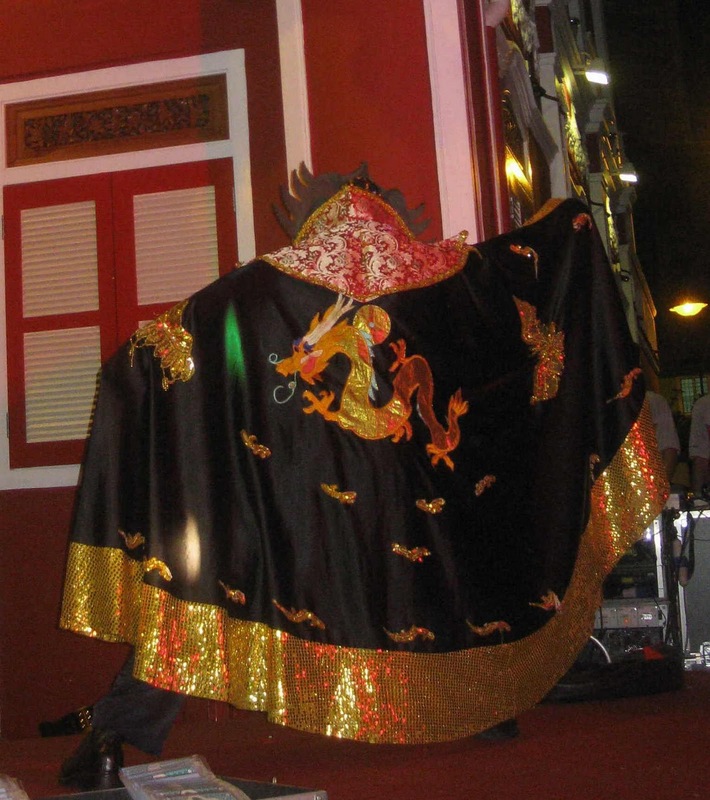 Their trade is distinguished by black sam-foo (blouse & trousers) outfits teamed with a red headdress. Single young men sinkheh have the inexpensive option to sleep on foldable canvas beds, opened in the corridor after everyone has retired into their rooms. The last to bed, they are also the first to wake and clear away their beds before the rest of the household starts their day. In the narrow kitchen, observe how the walls are blackened from years of burning charcoal stoves and don’t miss the chance to peek into the much-used tiny bathroom and bucket toilets. Pause here to listen to a snippet of conversation in Cantonese between occupants living at different levels – one persuading the other to turn off the low-pressure piped water so that she could have some! - Notice the toilet paper! Stop by the scaled model of shophouse to see a cross-section of typical shophouses in Chinatown that literally accommodated a whole community. Press the buttons that light up each section for a closer look to understand the horror of overcrowded and windowless conditions. Notice that there are no rear exit doors in the upper levels so ‘full’ toilet buckets have to be carried out through the long shophouse, all the way downstairs. Knowing that the temperament of the “night-soil” collector is as foul as his trade, occupants maintain perfect silence and will not indicate distaste especially as the foul bucket passes by. They are careful not to offend him because any offensive behaviour could result in him accidentally spilling its contents in the middle of the corridor! A riddle modern people may not know the answer to is, “What vehicle has 36 doors?” Only those who are acquainted with the bucket toilet system may know because it’s the vehicle used by the night-soil collector to carry the buckets! Dodo, a multi-talented artiste from Harbin, China, was the main attraction at the live performance in Tan Hiok Nee Cultural Street one Saturday night last May. A crowd of about 500 people were mesmerized, charmed and entertained in this special show, jointly organized by the Johor Baru Chinese Association and Tan Chai Puan, Director of the Teochew Eight Districts Association. This was just one of the many live entertainment shows lined up in the coming weeks at Johor Baru’s main Chinese cultural street. Every Saturday night, Tan Hiok Nee Cultural Street is closed to vehicular traffic and turned into a street carnival lined with several stalls that serve Chinese specialties and sell souvenirs and useful knick-knacks. The air is fragrant with freshly fried Teochew snacks that customers buy to eat piping hot or for takeaways. Meanwhile fans of karaoke, join the queue to belt out their favourite songs to an appreciative audience. In an effort to keep the culture and heritage of the Chinese community Johor Baru alive, the Chinese Associations in Johor Baru are bringing back the excitement and nostalgia of street entertainment for a new generation to experience and enjoy. Tan recalled that when he was growing up in Jalan Ungku Puan, he used to watch live street entertainment usually provided by peddlers and medicine men that attracted crowds with their amazing feats. On that Saturday night, the heart of old Johor Baru throbbed with the fun and excitement reminiscent of bygone days as Dodo took to the stage with his dramatic mask-changing performance. 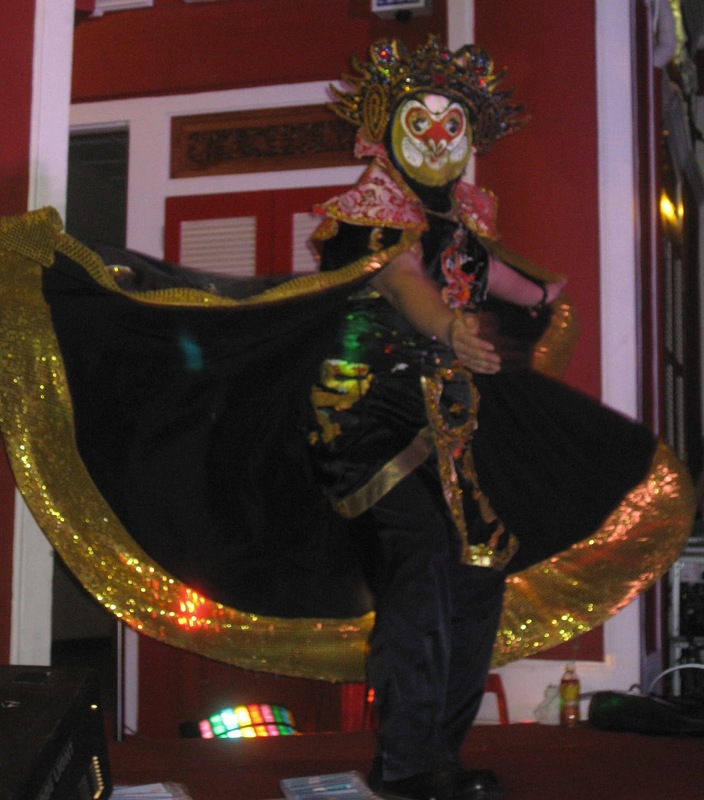 Mask-changing or face-changing is literally translated as “Bian Lian” in Chinese language. This ancient Chinese dramatic art has a history of 300 years and is part of the Szechuan opera. It is considered one of China’s most elusive performing arts because of its closely guarded secrets and technically forbidden to women because when they marry, this secret art may be shared with her new family. The audience at Tan Hiok Nee Cultural Street was in awe of Dodo and responded with appreciative applause as they watched him perform his slick moves skillfully to dramatic music. With a flourish of his arms and the clever flick of his cloak, his painted mask changed in quick succession in split seconds. Full-face, painted silk masks designed in vivid colours changed in a blink of an eye from a demon-face monster to the Monkey god and on to a clown’s face in a series of quick changes. In full view of his audience, Dodo moved skillfully with no contact between his hands and his face but the masks kept changing in split seconds with the mere flick of his head. All too soon the full-face masks gave way to a half-mask and suddenly it was over when he whisked off his head-dress and cloak to reveal his own face and clean shaven head save for a tiny tuft of hair. The momentum and mystery of the art added to the magic of the evening as the audience was absolutely wowed by his act. 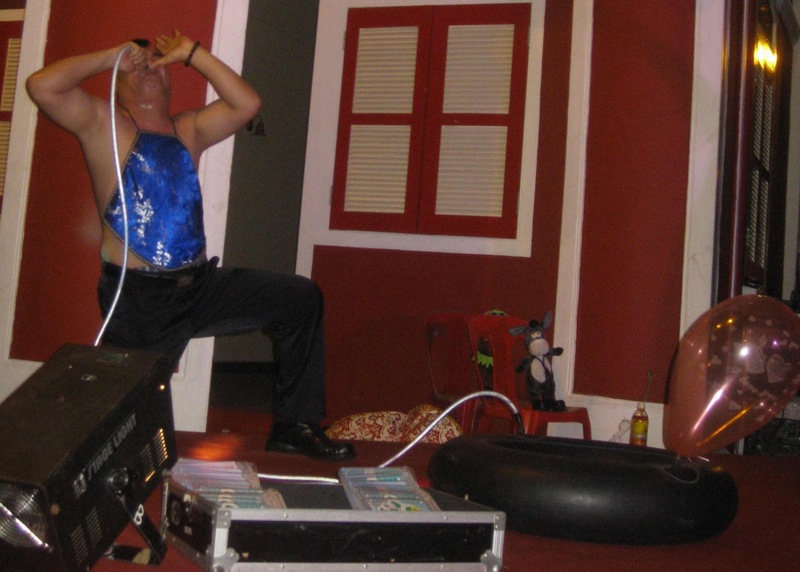 Dodo continued to thrill his audience with more amazing feats like blowing up a rubber tube of a truck tyre using just one nostril, in 60 seconds. 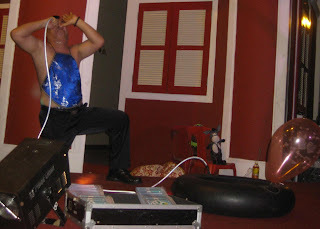 A balloon attached to the tube gradually expanded along with the tube until the balloon exploded. As if this was not proof enough of his prowess, Dodo picked up a Chinese traditional wind instrument and played it melodiously, also by using a single nostril. With the enthusiastic response from his audience, this prolific entertainer was unstoppable. He went on to play the saxophone, trumpet and traditional Chinese flute – this time with his mouth – and had enough breath to belt out a few popluar Chinese songs while he interacted with the audience. For the finale, Dodo had everyone totally mesmerized by his fire-breathing act as he lit up the night sky with giant plumes of fire. At the close of this show, Tan was upbeat about how the proud heritage of street entertainment can thrive in Johor Baru with the support of families and tourists who make Tan Hiok Nee Cultural Street a regular destination. There was an air of eager anticipation among the audience when Tan said there will be a "dragon" spanning the length of Jalan Tan Hiok Nee with its head at the top of Bukit Timbalan and its tail at the OCBC Bank. The dragon is a metaphor he used to illustrate the constant stream of people who will throng this area during the Johor Baru Arts Festival. Last July, the Tan Hiok Nee Cultural Street Committee worked in partnership with the annual Arts Festival to bring more excitement to the heart of Johor Baru. 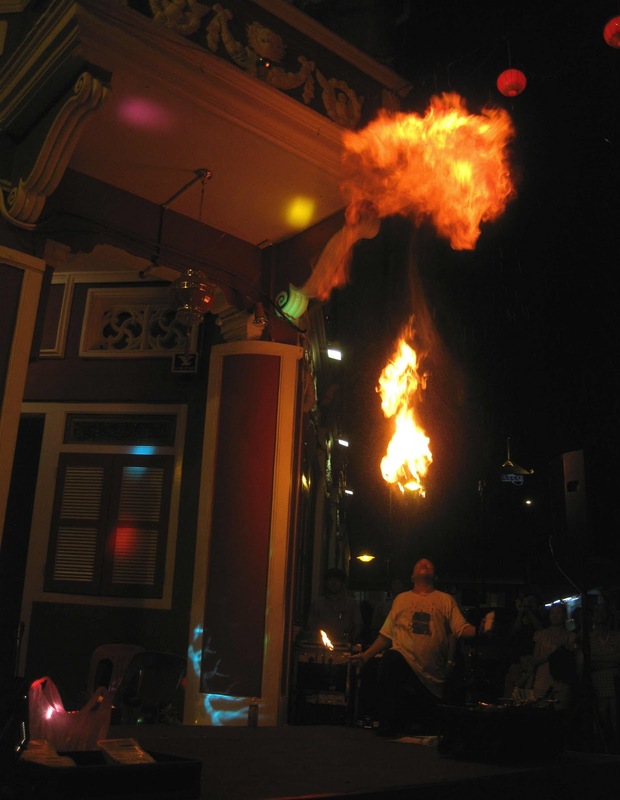 If you missed this exciting show, there's still an opportunity to see Dodo perform his amazing feats again when he is featured "live" at Tan Hiok Nee Cultural Street this coming weekend. Make a date with him this Saturday, 21 January 2012 and be there before 8pm. Happy Chinese New Year of the Dragon! Chakra, one of Johor Baru’s established fine-dine Indian restaurants, continues to tantalize discerning tastebuds with interesting seasonal specialties. 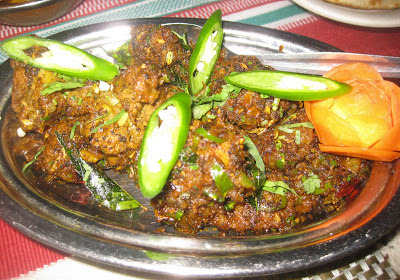 If you are partial towards turkey but have had enough of it prepared in the traditional recipe, then you must try Chakra’s turkey specialty. Prepared in a spicy paratal recipe, this turkey dish is the perfect gravy to complement freshly-made Indian breads like naan. Just ask for their current promotions that may not be listed in the ala carte menu. And while your meal is being cooked, whet your appetite with crunchy discs of pappadam. Chilled Mango Lassi, a delicious chilled yoghurt drink made with fresh mangoes, is a highly recommended thirst-quencher. But if you prefer a warm drink, their brew of masala tea served in a delicate cup and saucer set, is simply delicious! Garlic naan and Kulcha naan are among the most popular Indian breads in Chakra’s menu of breads. 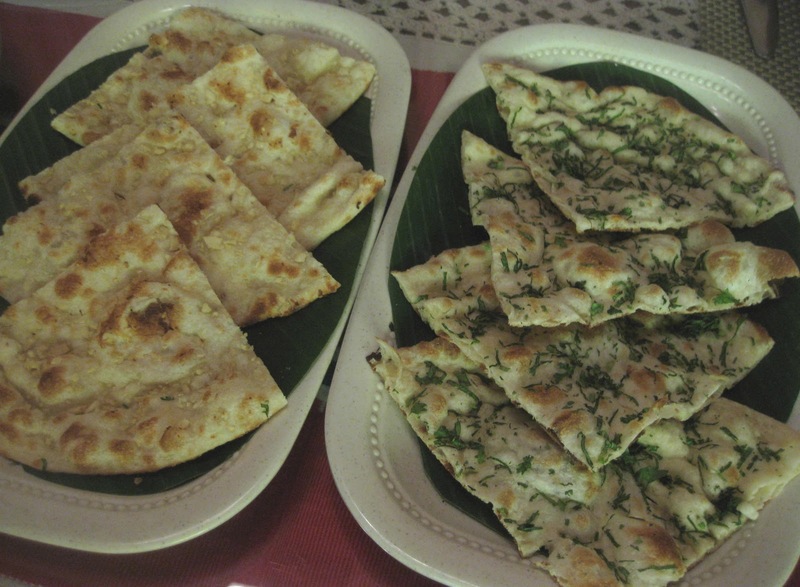 As defined by their names, these flatbreads are seasoned with generous amounts of garlic in the former and lots of chopped coriander leaves in the latter, before being baked inside giant heated earthen jars. These round pieces of bread are cut into quarters and served hot from the oven. For this festive season, Chef Fakir Khan, 41, and Chef Imtiaz Khan, 30, have designed an exciting menu of specialties using poultry like turkey and goose. 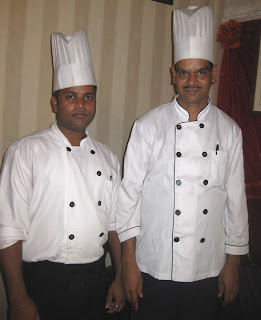 These versatile chefs, who hail from Orissa state in India, are combining their culinary experience to create mouth-watering recipes to complement meals served with either rice or breads. 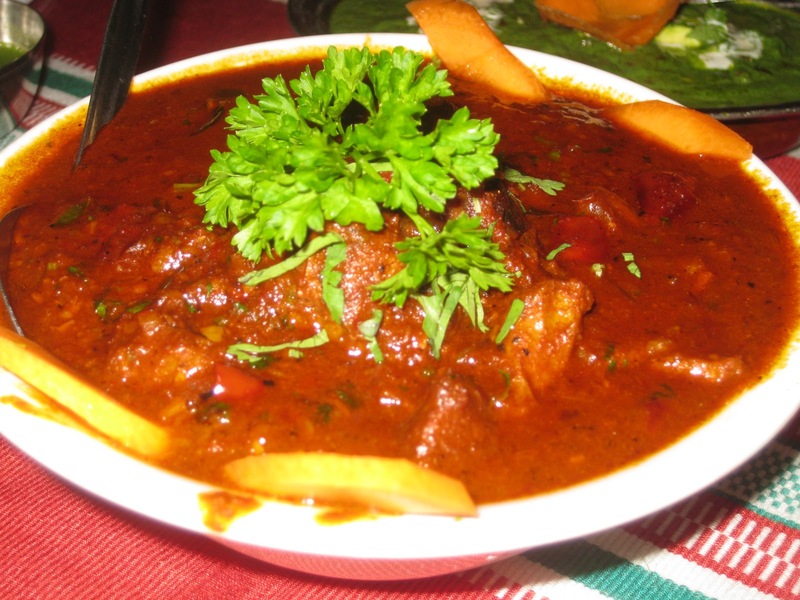 Among the items on the menu are tasty turkey peratal and a spicy zinger dish of goose varuval. 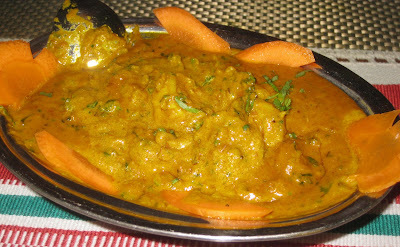 Seafood lovers will enjoy Prawn Kotamali made with de-shelled prawns and cooked in rich, creamy gravy and garnished with lots of kotamali or coriander leaves. Chakra at No. 1, Jalan Yusuf Taha, 80100 Johor Baru, is located parallel to the Inner Ring Road and adjacent to Jalan Yahya Awal. It is housed in a charming 70-year old former family home that once hosted Indian celebrities and remains a popular dining destination for prominent politicians and dignitaries as well as Johor royalty. Chakra has private rooms, upstairs dining hall and an alfresco terrace that’s perfect for tandoori parties. For reservations, private events and catering, Tel: 607 – 223 9991. 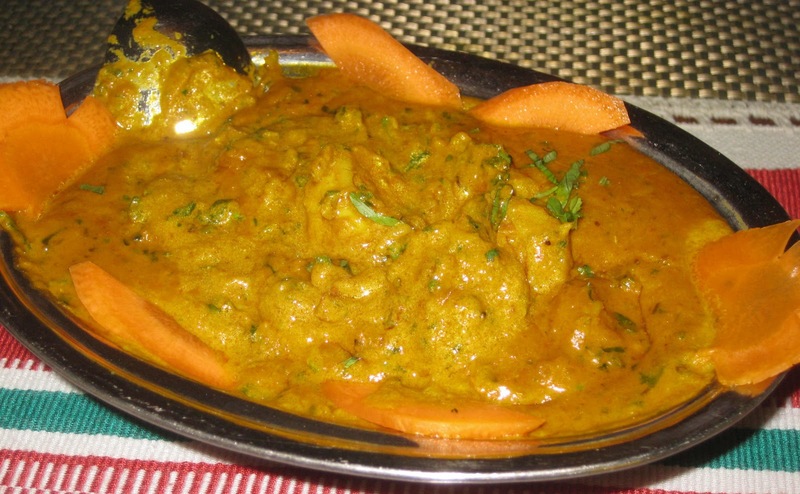 Open daily for lunch from 11.30am to 3.30pm and dinner from 6.30pm to 10.30pm. Goose varuval, another seasonal specialty - quite a zinger! The sturdy single-storey building at Jalan Sulaiman, a short street that links Jalan Wong Ah Fook and Jalan Trus, is believed to have been built in 1920. 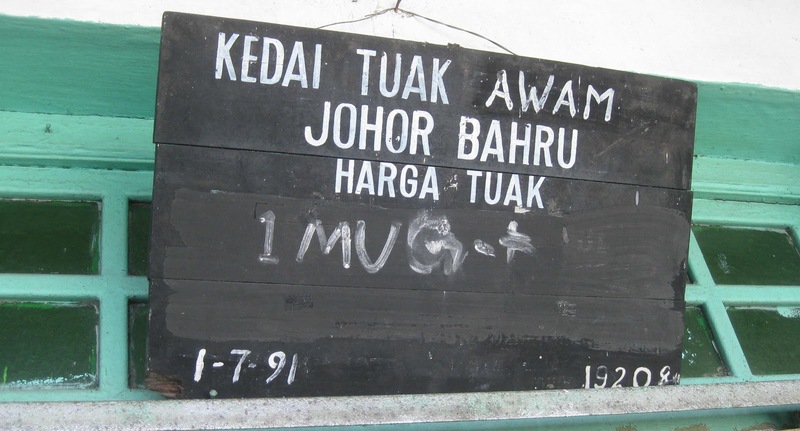 A wooden signboard hanging above its main door reads, Kedai Tuak Awam Johor Baru [Johor Baru Public Toddy Shop]. 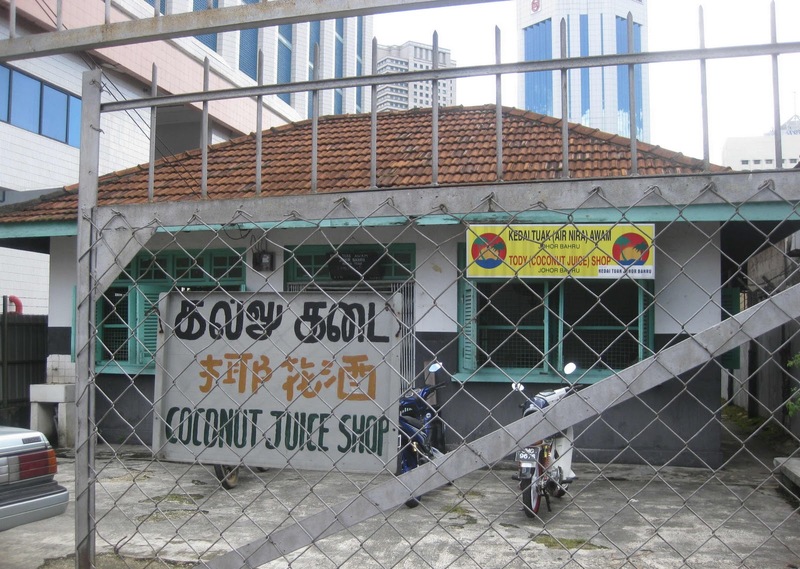 A metal plaque on the gate has information in three languages – Tamil, Chinese and the English translation that reads as Coconut Juice Shop. Next to these signs, a larger more colourful signboard stands out in stark contrast. With illustrations of coconut palms and the words, “Air Nira, Toddy and Coconut Juice” emblazoned on it, passers-by will have an idea of what is being served here. 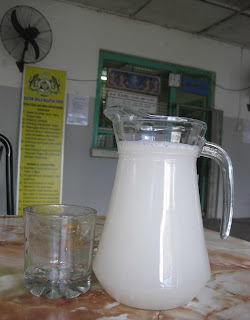 It’s toddy or fermented palm wine, an alcoholic beverage produced from the flower of the coconut palm. Originally the toddy shop was run by personnel of the Royal Malaysian Customs, Johor [Kastam DiRaja Malaysia Johor], and managed by three key staff – Pak Osman, Mr Manikam and a Chinese lady clerk who has since passed away. While Pak Osman retired to Muar, Mr Manikam worked here for about 40 years before he too retired. Then Chelladurai Loorthusami took over under license with the Royal Malaysian Customs, Johor and operated the business for 32 years. With foresight and an enterprising spirit, Chelladurai and his son Nagalingam Chelladurai, 49, carried out surveys and research on the various types of coconut palms and decided to replant his old rubber plantation in Lima Kedai with coconut palms. They maximized land use by planting the Mawar and Matah species of coconuts and reared goats in the plantation. Chelladurai retired six years ago and his son now operates the business with the help of his nephew Mathaialakan Kannaiah, better known as Suresh, and Balakrishnan Kota Raman. 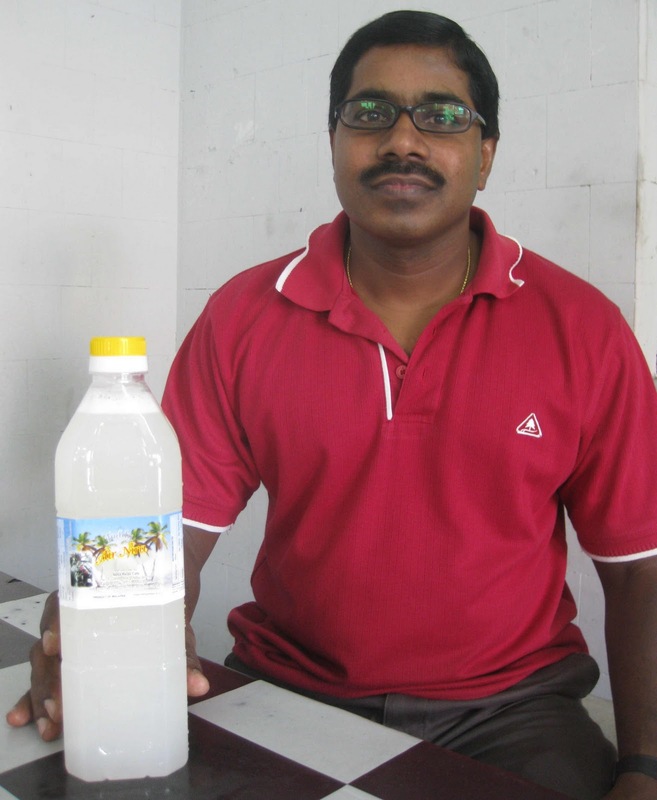 “Balakrishnan used to climb the coconut palms to harvest toddy,” said Nagalingam, adding that Balakrishnan started working as a palm juice tapper and has been with the business for more than 30 years. 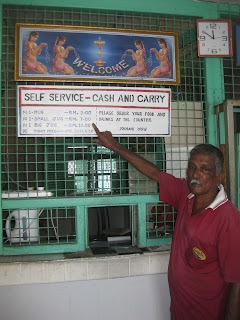 At age 61, Balakrishnan no longer climbs trees but he still helps Suresh with the business in the shop. “Everyday I go to the plantation at 8am to collect fresh toddy,” said Suresh who would be back in the shop with about 50 liters of toddy to open for business by 10am. He said on an average, regulars usually enjoy 2 to 3 mugs of toddy on each visit. 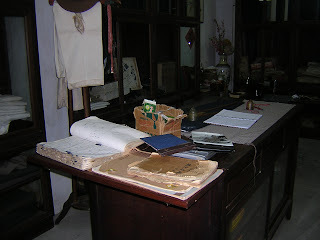 During the day, the shop is virtually empty but there is usually a crowd on weekends. The sparsely furnished front hall seems hardly able to accommodate a handful of customers but the rear courtyard is certainly big enough for a regular crowd. The spacious courtyard is furnished with tall concrete tables and stools that are cemented to the ground. An interesting feature is the rows of parallel high metal fences, painted bright green colour, built in front of the outer sales counters. The counters are also sealed in wire mesh with only a small window open at the bottom edge for the transaction. 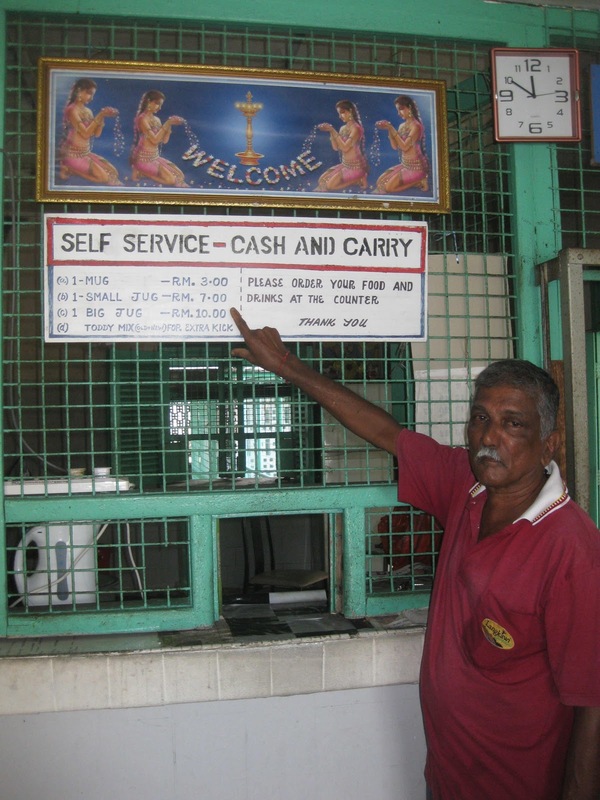 “During my father’s time, it can sometimes get so crowded that queues have to be controlled,” said Nagalingam, explaining the need for high fences at the sales counters and implying that customers are more orderly now. He said regulars at the shop include doctors and lawyers who buy takeaways and every now and then, foreign tourists drop in for a drink. “I’ve been coming here for more than 25 years,” said Balakrishnan Mulogam, 54, a retired army officer who was formerly attached to the Majidee Camp. When he was off duty from his job in Singapore, Tamilivaan Krishnan, 25, would also be in the shop. 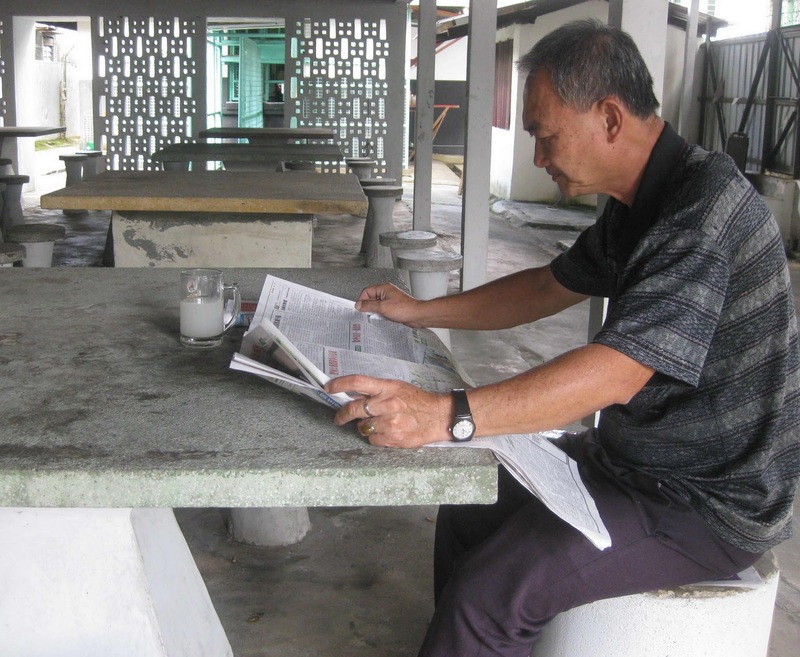 Like them, Leong Siong, 60, and his group of Chinese friends are regulars who enjoy a few toddies in the shop. Traditionally, toddy is also an ingredient for making tosai, apom, sponge cake and even pau pastry. Fresh toddy tastes sparkling sweet with a little sour aftertaste. Nagalingam said toddy has many health benefits including controlling diabetes and half a glass can even be given to children as medicine weekly or fortnightly. “It’s a natural product,” he said, emphasizing that it’s normal to sometimes see bees or ants in the beverage. “But customer satisfaction is important,” he added, aware that there must be hygienic handling and good service at all times. Tasty fresh toddy, served at room temperature, is clearly an acquired taste and its popularity has kept this shop in business for generations. The Johor Baru Public Toddy Shop, located at JKR 467 Jalan Sulaiman, Johor Baru, is open daily from 10am to 5pm. Gerard said: Honestly was not aware that the toddy shop was alive and kicking. Goodness! You have even made it look dignified! !